Save Camden....or next it could be Afflecks Palace!!! Topshop, New Look, H&M, the country is practically dominated by these ‘top designer’ brands. So what becomes of our favourite little joints, where we can find our jackets, shoes or accessories that no other known place can posses? I would be a hypocrite to say the big brands need wiping off the face of our beloved island, I’ve gone into good ol’ (all of those three at the start) and walked out with a jacket that you couldn’t get if you looked in the New York GAP, shoes that aren’t addidas or converse and a suit that could easily be mistaken for Versace or Ted Baker. I can honestly say however, that I am not devoted to them. The problem is, as the monster chains gradually take over, the smaller, better places fall casualty: The only reason why I bought that Topman suit was because, I intended to go to a minor shop called ‘Les Deux Zebres’, but it fell into one of those ‘can’t compete with bigger businesses’ stories, so the owner packed up and moved away. Eventually, I found myself walking into the one place I could find that had suits that weren’t £200, just about didn’t break my 6th form dress code (bull crap as you can imagine) and wasn’t Primark. Our very favourite spots are now under threat (or at least one of them is). Almost every city has a unique shopping market, with vintage, rare and classic fashions for excellent prices e.g. Manchester has Affleck’s Palace – 4 floors packed with clothing that the major retailers wouldn’t dream of going anywhere near. 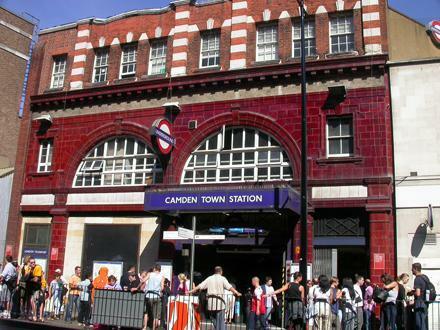 Another place that is sacred to fashion is London’s Camden Town. In fact, Camden isn’t just important to what we make up our image from, it’s full of major landmarks: pubs and clubs that have seen the likes of The Clash, The Jam and The Libertines and many beautiful graffiti paintings, such as a portrait of Syd Barrett and a Banksy stencil of a cleaning made lifting up a wall, as if it’s just a carpet and sweeping filth underneath. What will become of this place? The Stables Market, the very core of the town, will be demolished to make way for the infamous ‘shopping centre’ with rents so high that only the monster chains can afford them. Of course, once that happens the whole non-commercial atmosphere will be ruined. A new shopping centre will encourage all the other world dominating companies to plant their weed seeds all over the streets. How can this happen? All you need to know is on myspace.com/savecamden.